Edward Stewart, ex British Special Forces, that retired early to chase his dream of being a pilot. He received his FAA Private Pilot license on July 31, 2017 after only 5 days of training with 14DAYPILOT. He started flight school in the UK and continued to a flight school in California, acquiring 120 hours of flight time. 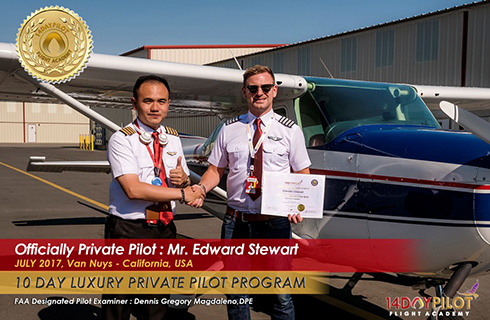 Due to delayed training, and busy instructors, Edward decided to join 14DAYPILOT to complete his PPL course.